David Briggs is an anomaly amongst organists today as not only is he a truly gifted and accomplished musician, he also is a fiendishly good improviser, a composer of note and a prolific transcriber to organ, of many composers symphonic works. Plus a lot else! I attended a concert held in St Mary's Cathedral, Johannesburg where he dazzled the audience with virtuoso playing and listened to a short improvisation which was actually musical. This to me is important as very often improvisations can be anything but pleasant to listen to. 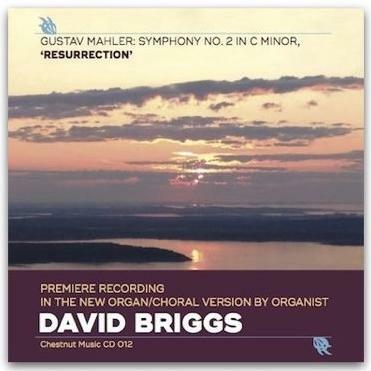 Gustav Mahler's Symphony No 2 in C minor, the ‘Resurrection'. Premier recording of the new transcription for Choir, Soloists and Organ by David Briggs. "Several important ingredients go into both the making and the performance of successful organ transcriptions. I always start from the full orchestral score and not a piano reduction. It's perhaps surprising that, with Mahler's symphonies, it's not necessary to reduce too much, or to leave too much out. If you look at the sketches, things are often quite clear (and written for piano over three staves). 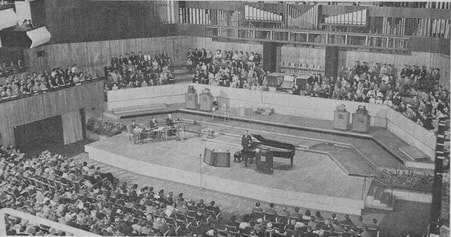 The magic with Mahler comes, of course, from the subtlety of the orchestral color, but with modern organ console technology and a degree of imagination it's possible to replicate (or more accurately translate) this in a new medium. It's important, too, not to make the transcription unplayable... I tend to find ways, through octave transpositions, reorganising of the voicing of the harmony, and so on, to make the music lie well under the hands and both feet. Processing each note is a very time-consuming (and rather therapeutic) exercise – each bar requires a large amount of thought and this is a perfect way to get to know a score very intimately. In making the transcriptions, I'm quite disciplined about including the composers' original intentions for phrasing, articulations, and dynamic parameters. More than that, though, I leave to the integrity and free will of the performer... From the performance point of view, I always endeavor to adopt a registration scheme that has as much color and vivacity as the orchestra, but not necessarily the same explicit colors. There are certain instruments we just don't have, but I think with care it's possible to create registrations that have the same emotional ambience, clarity, and contrast... You try and imagine what Mahler would say if he were standing over your shoulder. My profound hope is that people will enjoy playing and hearing these recastings of Mahler's originals, rather like seeing great paintings in a new art gallery, in a different frame under completely new lighting conditions. This is highly charged, emotional music that shows Mahler's complete genius for creating a highly original soundscape, which is instantly recognizable and completely inimitable." “A symphony must be like the world. It must contain everything” (Gustav Mahler). David Briggs first fell in love with the music of Gustav Mahler as the 17-year old Principal Viola of the National Youth Orchestra of Great Britain. Completely under Mahler's spell for the past three decades, one of his most major projects has been to transcribe the great orchestral symphonies (2, 3, 4, 5, 6 and 8) for the organ. In this respect he is unique in the world and his performances and recordings have met with considerable critical acclaim in the international musical press. The Mahler 2nd looses nothing in the transcription, if anything the solo organ adds to the enjoyment. A very important part of transcriptions such as these is that works can be performed by a single player and use the available choral assets in a church which brings live performances at a far lower cost. The performance in this recording is nothing short of great and the recording itself is very good with the caveat that a speaker system capable of reproducing the bass at the right level is a must as it underpins the work. Most definitely something to add to your collection.